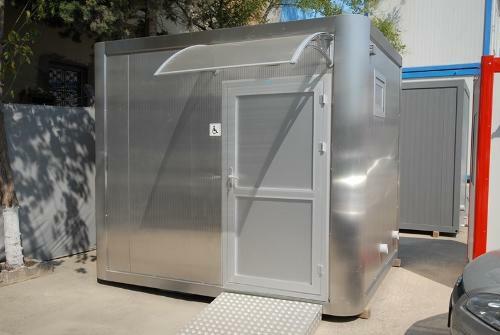 Camp Container - OZGE YAPI PREFABRICATED COORP. Container camp building solutions are another preferred construction system apart from prefabricated building solutions for camp buildings. Interlocked container solutions are also composed by using different sizes designated as per the project, apart from our standard sizes of 2,40×6,00 m and 3,00×7,00 m. It is one of the methods where the fastest assembly is provided at the site for site office, dining hall, dormitory, infirmary and suchlike functions. The pre-production of the containers are completed at the factory and only the assembly takes place at the site. It is possible to develop one, two or three storey solutions. Static addition is required for the bottom container in two or three storey containers. Roof reinforcement can be performed as regards to climate conditions where the containers shall be assembled, if necessary. Thereby it is mandatory to specify all technical details in preliminary project process. It is possible to transport the containers to the site as monoblock or demounted according to the country where the project will be performed. Hekim Flat-Pack, Hekim Demountable and Hekim Profile System container solutions are developed for our containers especially shipped to far-off countries. Hekim Classic and Hekim Panel systems are models used in monoblock productions.